After over a year of development, we're excited to announce our Swing Away Seat is available to order. To read more about the development of the seat, read this. The Swing Away Seat is cast in gray iron and powder coated in satin black. 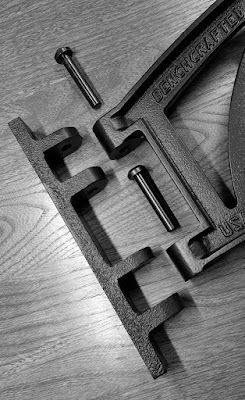 When you buy the seat you'll receive two castings: the larger part called the mount, and the smaller part which bolts to your bench, called the bracket. You'll also receive two black oxide-finished steel pins that marry the parts together. They are loose pins, just like you'd find in a door hinge. So if you need to remove the mount from the bench for whatever reason, you simply lift the two pins and the mount comes off. 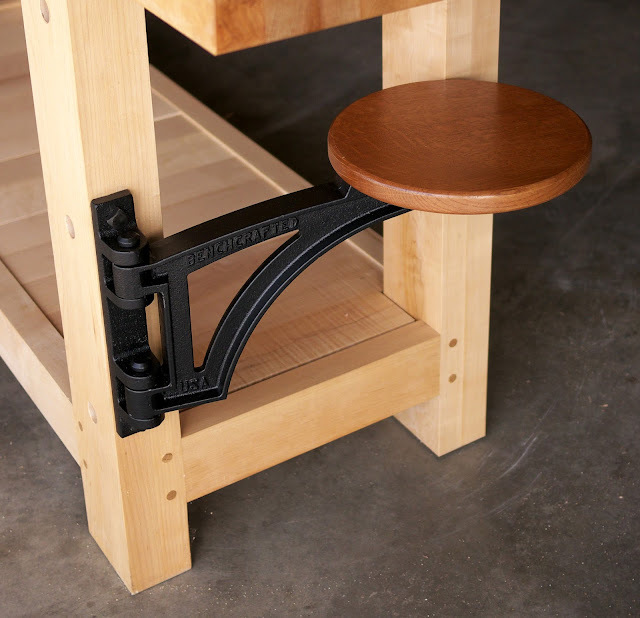 Mounting the seat to your bench or table is easy with two 1/2" lag screws or through bolts. Bolts are the stronger option, and if you've got 3" or less of wood to bite into, we recommend bolts. Lag screws, driven into properly-sized pilot holes in hardwood are extremely strong. However, since we can't control your mounting situation or skills, we can only make general suggestions. As such, the Swing Away Seat does not come with mounting hardware. Be wary of hardware store and home-center lag screws. They are usually total junk (but not always) with soft steel and shallow threads. We source ours from the excellent Blacksmithbolt.com. 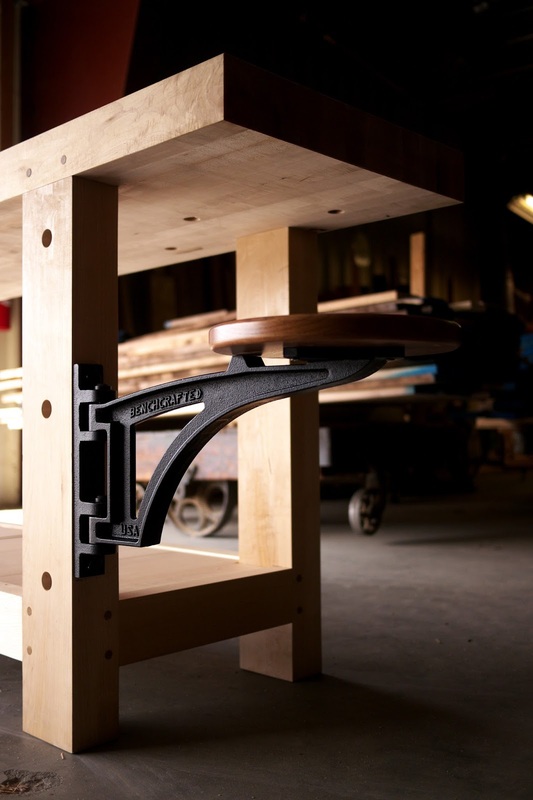 The 1/2" square head lags in black oxide work very well with the Swing Away seat. We also recommend their rub washers under the head of lag screws for a smooth connection. These aren't so necessary with through bolts. For further installation info, download the Swing Away Seat document from our downloads page. The Swing Away seat is available two ways. 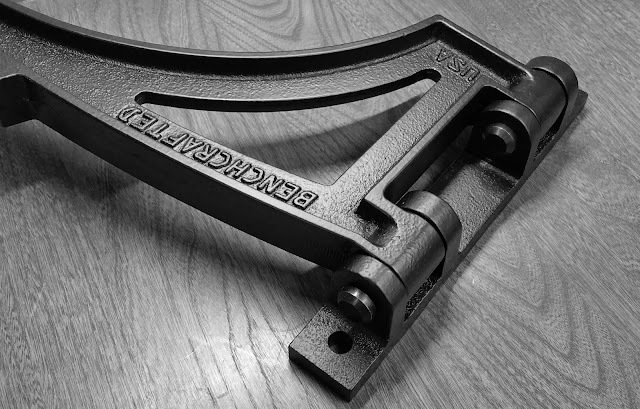 Castings only, for us woodworkers who want to make our own seats, or packaged with a finished, ready to mount wood seat. The wood will be offered in one species only, quartersawn white oak with a chestnut stain and satin lacquer finish. The seat is 11" in diameter and ~1" thick. Each wood seat will include three screws to attach it to the mount. Like our vises, the Swing Away seat is overbuilt. We haven't done any testing on how much weight the casting can take before it breaks, but our empirical knowledge tells us its more than anyone need worry about. Since the seat is cantilevered off its mounting surface, one does have to be mindful of the mounting structure. Obviously a free-standing structure could be prone to tipping, depending on the weight of the structure and the sitter. Again, there are lots of variables at play here that we can't possibly anticipate. 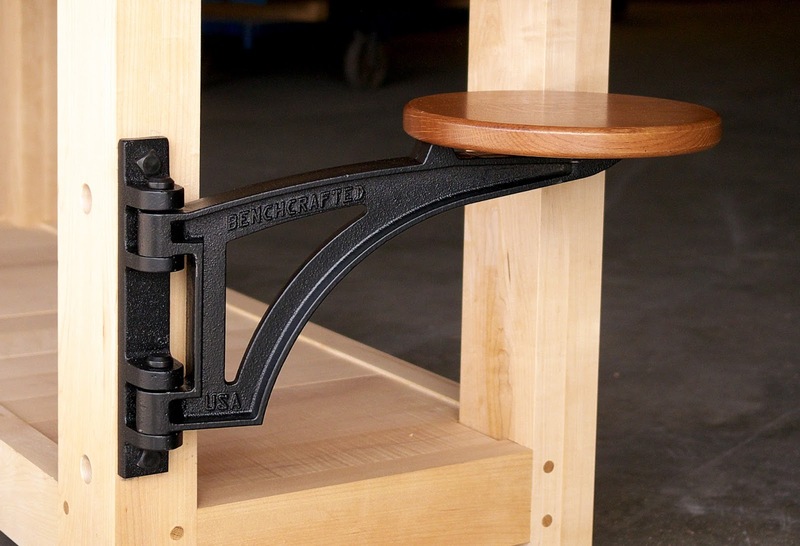 Our Classic Workbench (pictured here) is not a super heavy bench, being somewhat narrow at 20" with a 3" thick top. Yet it supports a 250 pound body (me) without tipping. If you're planning to use one of these on any free standing object, keep this in mind. Again, see the installation document for further details. The Swing Away seat will pivot a bit over 180 degrees. The Swing Away Seat is $199. The Swing Away Seat with quartersawn oak seat is $249. You can order through our Store Page. What is the gap between the two wholes on the mounting bracket? I just called Blacksmith Bolt. There minimum order is 10 lags, (~$15) + washers +shipping = $29. I need two 1/2' x 2 1/2" (or 3") lag screws. I was not the first Benchcrafted customer to call them on this. Jameel, would it be great for you to offer lag screws on your site for those of us ordering the swing away seat. Dave, you don't have to use the square head lags. We've also used hex head lags from the local hardware store like Ace or True Value. We just like the look and quality from Blacksmith Bolt. Yes, they are a bit more expensive than the local place, but you'll probably end up using those extra three bolts eventually. And I always order a few extra wood screws in common sizes while I'm at it to make the shipping more worth it. 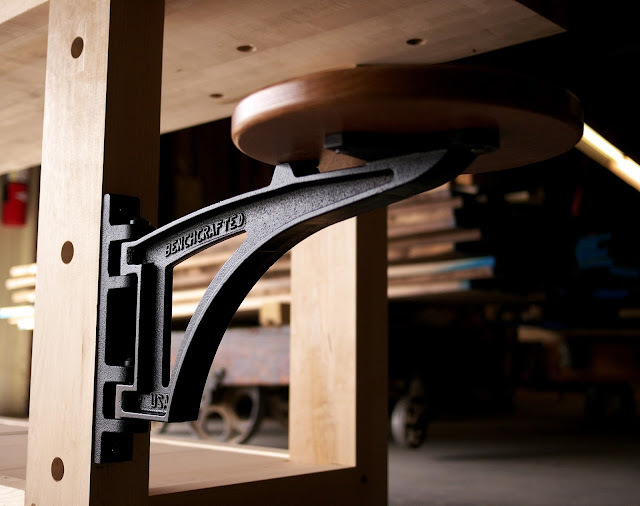 We like to support small businesses, and the folks at Blacksmith Bolt are just that. Again, just a friendly warning that hardware store bolts CAN be lousy, but that's not always the case. Check them first. I'm sure you can find some local ones that will work just fine. And once you paint them black you'll never notice. It appears that this item is for sale, but the sale page is not functional - is there a release date on this? Or simply scroll up and click "Accessories"